Volvo Trucks is dramatically decreasing turnaround times of assembly line manufacturing tools by more than 94% since incorporating Stratasys additive manufacturing technology at its engine production facility in Lyon, France. 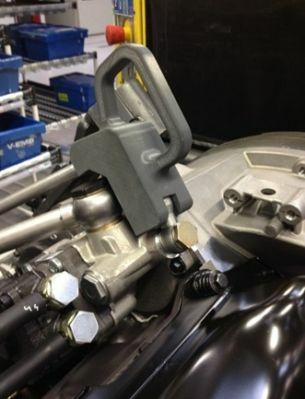 Using Stratasys additive manufacturing technology, Volvo Trucks has reduced turnaround times on certain clamps, jigs and supports from 36 days to just 2 days. According to Pierre Jenny, manufacturing director at Volvo Trucks, the company has reduced the time taken to design and manufacture certain tools traditionally produced in metal, from 36 days to just two days in thermoplastic ABSplus using its Stratasys Fortus 3D Production System. These significant gains in time are also improving the production plant's overall efficiency and flexibility; delivery times are upheld and the use of additive manufacturing has saved costs by reducing waste. From a financial perspective, Jenny estimates that, where customized or small quantities of tools are required, the all-in cost of 3D printing ABS thermoplastic items is, in some cases, as little as $1.13 per 0.06 cubic inches to $113 per 0.06 cubic inches if making the same item from metal. Assembly line tools produced by Volvo Trucks with Stratasys' FDM 3D printing technology include this durable, yet lightweight punching tool. Volvo Trucks purchased its Fortus 3D Production System from Stratasys' reseller CADvision and within a three month period had already 3D printed more than 30 different production tools to facilitate the way its production line operators worked. These include a range of different durable yet lightweight clamps, jigs, supports and even ergonomically-designed tool holders that ensure a more organized working environment for operators. "We're working in the heavy-industry sector, so reliability is naturally critical. 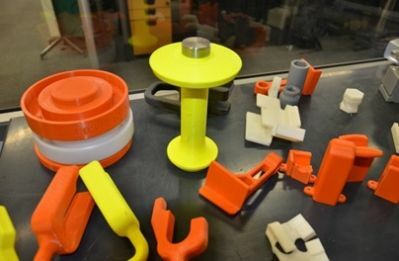 So far every piece that we have 3D printed has proved to be 100 percent fit-for-purpose," adds Jean-Marc Robin, Technical Manager, Volvo Trucks. "This is crucial from a practical aspect, but also instils trust among operators and quashes any traditional notion that everything has to be made from metal in order to function properly," he adds. According to Robin, developing production tools using additive manufacturing also enables the equipment design team to be far more responsive, while avoiding possible waste in the event of last minute design changes before tools are made. 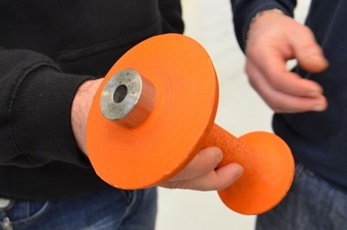 This Stratasys 3D printed hose holder (in gray) is used to maintain the position of an engine hose during engine assembly by the production line operator. "As exemplified at Volvo Trucks, using additive manufacturing for tooling and work-holding devices is a reliable solution for increasing efficiency in manufacturing processes. In many cases it is also the only feasible solution, as production by traditional method is limited due to cost- or design-constraints," concludes Middleton. Volvo Trucks' Lyon engine plant produces various engine types and sizes for the Volvo Group, including Renault Trucks, which the Group bought in 2001.